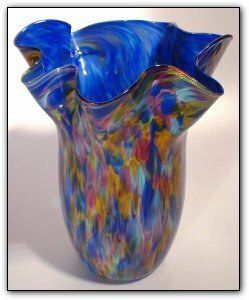 This fluted vase is from the End Of Day® series, meaning it is made with a variety of colors used throughout the day. The outside features lots of blues, pinks, purples, reds, orange, and yellows, and the inside is a very intense blue. This vase also has real gold adventurine added for a beautiful gold sparkle meaning that the more light you shine on it... the more it sparkles!